I wonder what happened to starting back to school at the end of August. Maybe there is so much more to teach now? Maybe the federal government thinks time means quality? 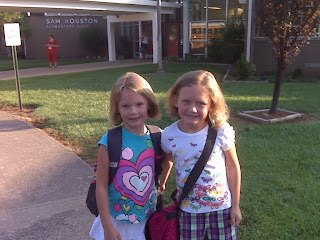 Whatever the dumb reason (and starting to school at the start of August is DUMB), today was the first day of school! Lindsay and Sara being forced to pose for Dad in front of the school. It will be a lot tougher to get them cooperate like this when they are in high school. 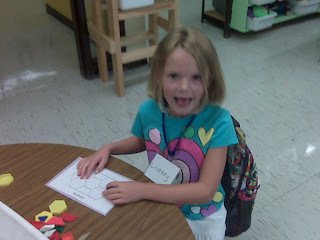 Lindsay is started first grade today. 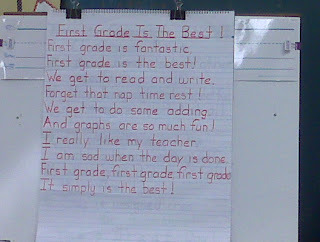 I started first grade in 1979. It's amazing to think that I did anything 30 years ago. Where has the time and disco music gone? Not sure what we are pointing at but everyone is looking. 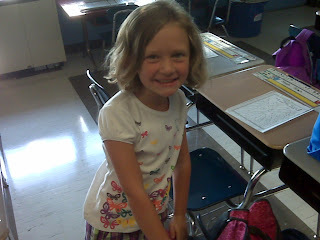 Lindsay does her best Gene Simmons to start first grade off right. 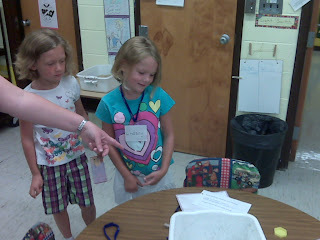 Sara has a big kid desk in second grade. Your work surface just continues to get bigger and bigger until you finally move into your own cubicle. So, we're back in the grind. I'll sneeze and Christmas will be here. I'm driving 150 miles south to Alabama tomorrow to install an invoice printer. When I'm done I'm turning right back around and coming back home. I like the Hampton points but I like the comfort of my own house even more.